A police officer who was on DWI patrol was hit by an alleged drunk driver early Monday and suffered life-threatening injuries, police said. Officer Willard Gomes, a 12-year veteran of the Nassau County (NY) Police Department, suffered serious head injuries, including swelling of the brain, reports WNBC. Gomes was in an unmarked car when it was hit head-on by a pickup truck that allegedly crossed over a double yellow line on Glen Cove Road in Roslyn around 2:30 a.m.
Gomes was taken to the hospital, where he was in serious but stable condition. He also broke vertebrae in his neck, broke an arm and a leg, cracked a rib and lost several teeth, among other injuries, officials said. 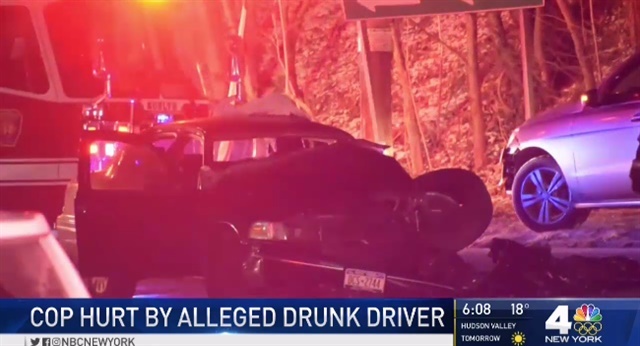 Prosecutors say the driver of the pickup truck, Keith Dillon, 29, had a blood alcohol level more than two times the legal limit, reports News 12 Long Island. During his hospital bedside arraignment at Nassau University Medical Center, prosecutors said Keith Dillon told police at the scene that he had been at a number of establishments drinking alcohol before the crash. Officials say he also admitted to taking medicinal marijuana at some point in the night. In his truck, prosecutors say there were two bags of Xanax and what appeared to be cocaine residue. Dillon pleaded not guilty to charges of vehicular assault, reckless assault, DWI and criminal possession of a controlled substance. His bond was set at $100,000.